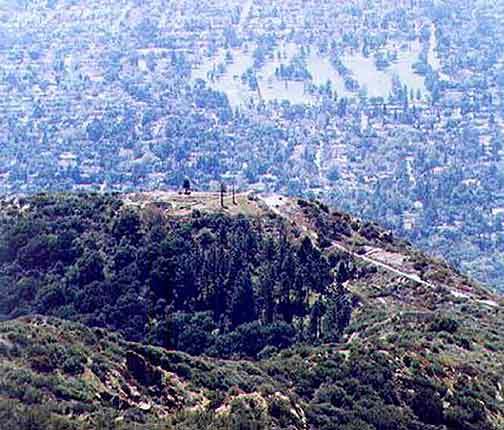 Echo Mountain, located in the foothills above Altadena, California, is a relatively easy hike that takes about 3 1/2 hours to complete. The above photo was taken on the Castle Canyon Trail that goes from Echo Mt. up to Inspiration Point. You are looking Southward down onto the Echo Mountain Resort ruins. In the background is the San Gabriel Valley and the City of Altadena. Below is the same view showing the resort in its heyday, circa 1896. Click here for a complete history of the Echo Mountain/Mount Lowe resort areas. YouTube© video about the history of the Mount Lowe Railway and the Echo Mountain Resort. Click here for an Aol© video by Michael Patris, President of the Mt. Lowe Preservation Society, about what remains of the Mount Lowe Railway and the Echo Mountain Resort. 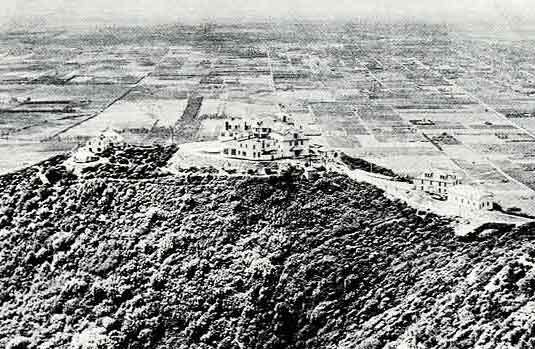 Click here to view a collection of historic photos from the Mount Lowe Preservation Society. Topo Maps: Pasadena and Mt. Wilson. 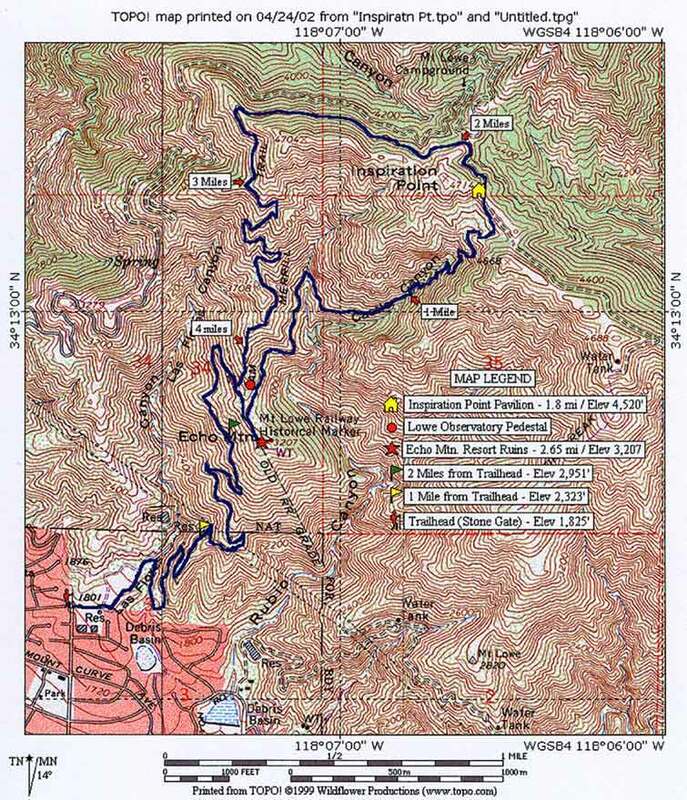 For a printable topo map of the trail, click here. Season: Anytime of the year but early Spring is the best. Distance: 5.4 miles roundtrip, 1,380 ft net elevation gain. Hike Time to Echo Mountain: About an hour and 45 minutes up from trailhead to ruins, at an easy pace, and about an hour and 15 minutes back down. Hike Time to Inspiration Point (via Castle Canyon Trail): An additional 2.0 Miles and 2 hours up at an easy pace (See Inspiration Point page for more details). Directions to Trailhead: From the 210 FWY in Pasadena, take the Lake Ave offramp and head north, towards the mountains. Continue north on Lake Ave as far as you can go which will bring you to the intersection of Loma Alta and Lake Avenues. On your right, you will see a large stone gate, which is the trailhead. Park on Lake and walk around the southside of the gate and continue walking for a couple hundred yards and you will come to a trail marker/register. Sign the register and continue across the creek bed and then the trail starts climbing up the mountain. For a detailed map and driving directions to the trailhead at the corner of Lake Avenue and Loma Alta Ave in Altadena, click here. Special notes about this hike: Since this trail is on a southern exposure, it can get very hot during the summer months. So if you plan to do this hike between June and September, it is recommended that you get as early a start as possible to avoid the heat. There are two picnic tables on the west side of the ruins so bring a sack lunch and there are also a series of informational plaques, placed at various points around the site, showing historical views of the resort when it was in operation. If it's not cloudy or "hazy", be prepared to enjoy some spectacular views of the San Gabriel Valley. Click on any of the thumbnails below to view the full sized picture and its description. E-mail me by clicking on my name next to the mailbox below. GIF Art - Copyright © 1995-1998 IDG Books Worldwide, Inc.